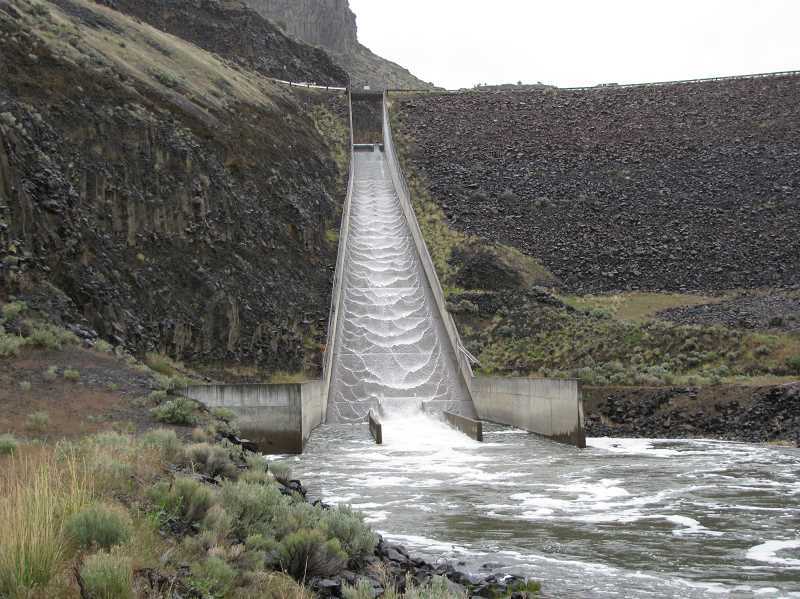 In an effort to conserve as much water as possible for future fish and wildlife habitat on the Crooked River, the Bureau of Reclamation has reduced its winter flows. The BOR made the decision with coordination from the U.S. Fish and Wildlife Services and NOAA Fisheries to reduce fish and wildlife winter flows from Bowman Dam from 65 cubic feet per second (cfs) to 50 cfs on Oct. 10. This action is based on recent information regarding total Prineville Reservoir storage, uncontracted storage, and meteorological conditions over the last several months and as forecasted for the next several months. "We didn't fill the reservoir (this year)," explained BOR Engineer Chris Runyan. "We actually ended up with the sixth lowest refill for the reservoir in the last 36 years." The low reservoir fill was caused by a poor winter snowpack and the dry summer that the Central Oregon area experienced, Runyan added. He noted that the water year is still about 75 percent of average precipitation overall, and average precipitation from July through September was only 16 percent of average. Things aren't expected to change for the better in the coming months. "What they are forecasting long term as this point is drier than average conditions through January," Runyan said. "We are keeping an eye on that." The water released for fish and wildlife habitat is a portion known as uncontracted water, unlike contracted water, which is reserved for irrigators and other water users. "The amounts are based on how much the reservoir fills each year," Runyan explained. "That amount of uncontracted storage available for fish and wildlife was quite a bit lower." BOR, with the help of the other agencies, is trying to reduce flows enough to keep fill levels up in subsequent years while providing as much fish and wildlife habitat on the Crooked River below the dam as possible. "You want to find that balance of not holding onto too much," Runyan said, but added that "conserving fish and wildlife storage for subsequent years is vital for maintaining in-stream flows during dry years." A flow of 50 cfs is expected to provide about 74 percent of chinook juvenile habitat and about 73 percent of steelhead juvenile habitat. The proposed flow modification would reduce available chinook and steelhead habitat by 8 percent and 7 percent, respectively. The decision comes on the heels of an apparent rebound in the number of redband trout in the Crooked River. Assistant District Fish Biologist Tim Porter estimated earlier this summer that the river had about 3,500 fish per mile that are at least 8 inches long. This was a drastic improvement over data from an October 2016 study that determined the density of fish had dipped to 350 trout per mile. Porter noted that during the winter of 2015-16, winter flow levels had dropped to about 35 cfs. Compounding the issue, the area experienced a severe cold snap and the fish had nowhere to go to escape it. For real-time Crooked River flows at BOR facilities in the Pacific Northwest Region, visit www.usbr.gov/pn/hydromet/rtindex/crooked.html.